House of Cards explores the history of the House of Stuart and House of Hanover in Kensington Palace as a playful, interactive experience, contrasting the splendour of the court’s public face with the secret intrigues and hidden intimacies of the Royals’ private lives. Coney was invited to create a radical new interpretation of the stories of Kensington Palace that would give the audience new ways to connect to the people and stories that populated the palace at the height of its glamour and power. Coney worked with a team of writers, designers, lighting and sound designers, artists and actors to create an interactive installation that audiences could explore and discover. House of Cards in the Queen’s Apartments ran until June 2014. The performance and choose-your-own-adventure story in the King’s Apartments was extended until September 2013 and closed to make way for palace renovations. 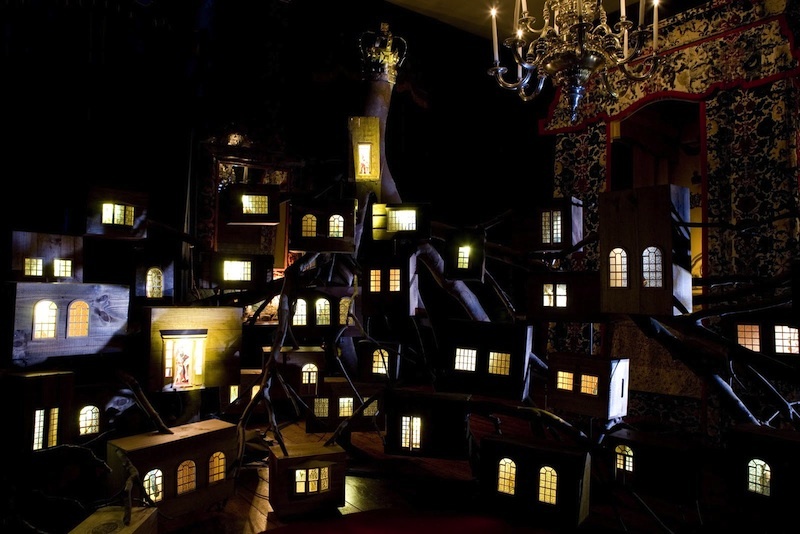 Coney transformed the Queen’s Apartments with a narrative exploring the rise and fall of the last generations of the Stuarts through installation, sound and animation. The story starts with the Glorious Revolution and ends with the death of William II & Mary II’s only heir- little William Henry, Duke of Gloucester, who danced himself to death at his 11th birthday party. In the King’s Apartments games of politics and wit have been played for many centuries but it was the ambitious, the beautiful and the clever who made their fortune. We created a choose-your-own-adventure story for audience to play their own game of court, meeting performers and unlocking stories along the way. Commisioned by Historic Royal Palaces to run from April 2012 to March 2013, House of Cards was extended until June 2014. You can read about the partnership between Coney and Historic Royal Palaces here on the Guardian Culture Professionals Network. Rupert Christiansen, The Telegraph, April 2012. And many others including: Aidy Sanders, Diana England, Foz Allan, Gemma Brockis, Jessica Joslin, Louis Ruscombe-King, Luke Woods & Wimbledon College of Art.